Barcelona looks like a city straight out of fairy tale. You’ll discover many secrets wandering through the streets of this Mediterranean city full of artists, architects, and rebels turned authors who tell its story. Whether you’re transported to another world walking through Gaudi’s’ architecture or witnessing the surrealist paintings of Dali and Picasso, there’s a little bit of magic wherever you go in Barcelona. Solitud by Victor Catala (ie. Caterina Albert) was published under a male pen name to avoid controversy. And thus enters our first heroine! The shadow of the wind by Carlos Ruiz Zafron is a novel set in Barcelona during the Spanish Civil War. The angst-ridden executive by Manuel Vazquez Montalban is a fun who-dun-it detective story set in the streets of Barcelona! Start the day with a hearty breakfast as we’ve got a lot of adventure ahead of us! Like a local grab a pastry and cafe con leche from your local cafe, or if you’re craving something more substantial, find your way to El Petit Princep in El Borne to indulge in a breakfast fit for a little prince (or princess). 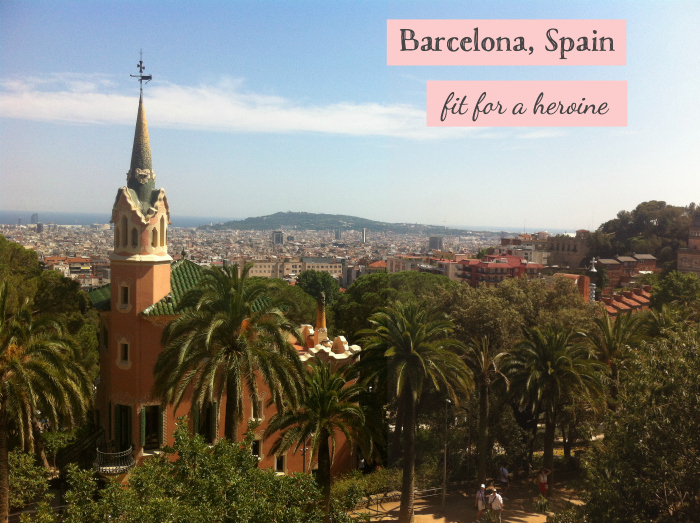 To kick off our adventures, jump on a bus to Park Guell. If you’ve ever wanted to feel like you’re wandering through your own fairy tale, this is the place. Gaudi’s stunning and unique architecture gives the place a magical feeling. You can spend an hour or two wandering around this park and taking in views of the city below. To continue our Gaudi fix, walk or grab a bus to the Sagrada Familia. You’ll notice the construction amidst the turrets, but don’t feel discouraged, this is part of the attraction! The church has been under construction for over 100 years with no end in (near) site! The interior is said to resemble a (forbidden) forest, and the outside boasts work from 4 different architects. It’s easy to imagine this giant gothic church as a setting in many a heroine’s tale. 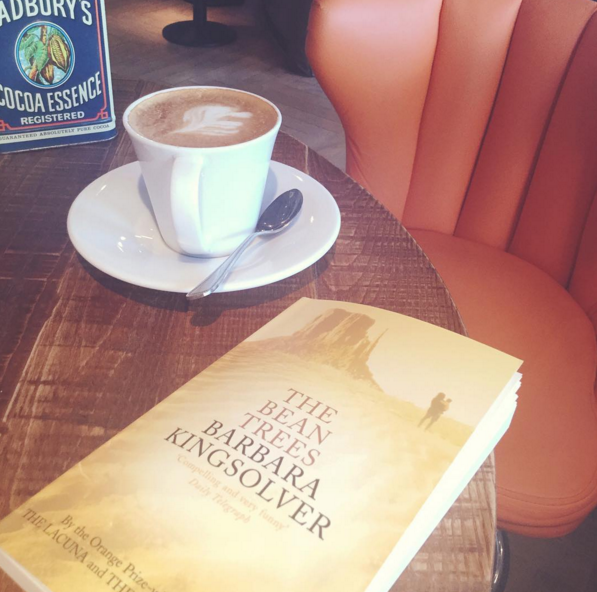 Make a literary break for your cafe con leche. Stretch your legs by wandering further downhill (all downhill roads lead to the water) until you find yourself at the Pudding Bar. If you’re short on reading material, pop into Laie across the road with a selection of books in different languages. Then head into the Pudding Bar for a funky Alice in Wonderland themed coffee and reading break. Be inspired to break out the journal and enjoy the surroundings. Continue down Carrer de Pau Claris into the gothic quarter. Get lost wandering around the narrow streets and enjoy the architecture. 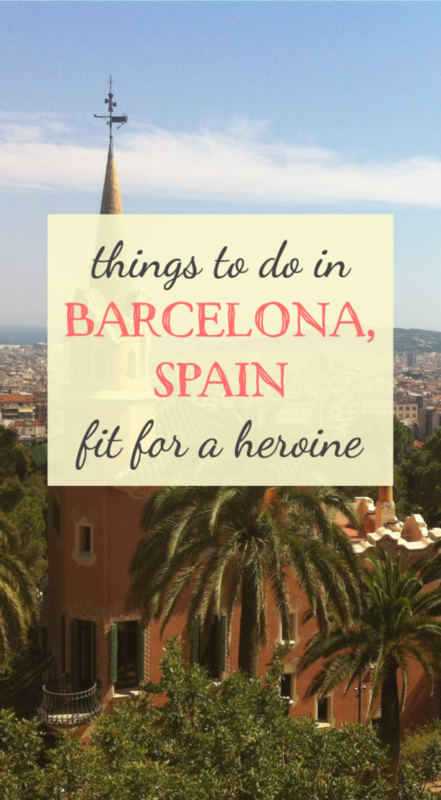 Keep an eye out for the Barcelona Cathedral, home to one of the city’s first heroines and Patron Saints, Eulalia. Eulalia is one of the first Christian martyr’s from the Roman period. At just 13 years old she received such punishments as being rolled around the city in a barrel full of knives for refusing to give up Christianity. She is now the co-Patron saint of Barcelona. The Rubio bridge next to the Cathedral and settled amongst gargoyles is a beautiful site. Lunch at Barcelona’s most famous tapas bar in La Boqueria market. 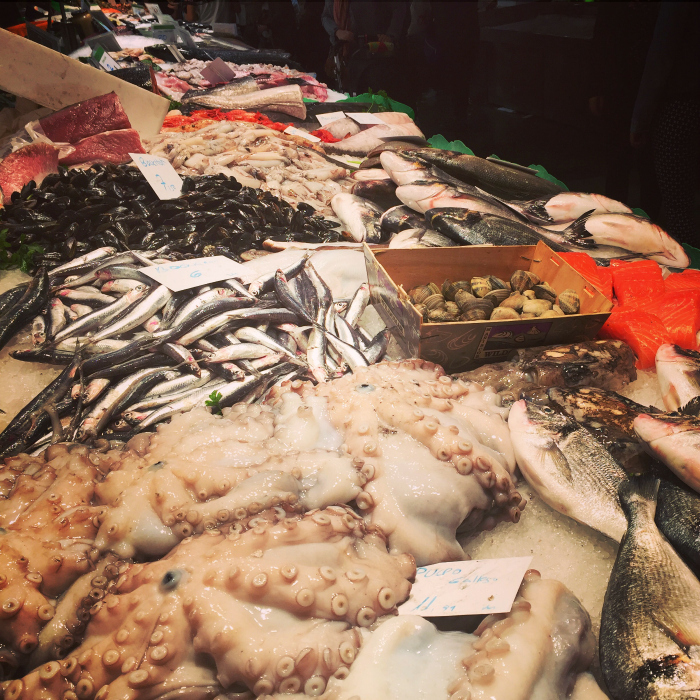 When you’re ready for lunch, cross Las Ramblas to get to La Boqueria, the most famous food market in Barcelona. Enjoy seeing the variety of Catalonian foods, and then find a seat at Bar Pinotoxo for traditional tapas, fresh seafood, and a lunchtime glass of Cava. If you have the time, wander around hip Raval, or simply follow Ramblas down to the water until you see the giant Columbus statue. The crafty geographer may notice that Columbus is actually pointing east, the opposite direction of the Americas to which he sailed. Several theories try to explain this, but my favourite is that he’s pointing towards his hometown in Genoa, Italy. Learn about the history of Catalonia. Follow the main road next to the water, passing the yachts, and then swing left into the Museum of Catalonian History. The museum houses 2 floors of exhibits, with stunning visual displays starting from ancient times and leading to the 20th century. It’s fascinating to see the different empires Catalonia passed under, and understand the unique history of the Catalonian people. 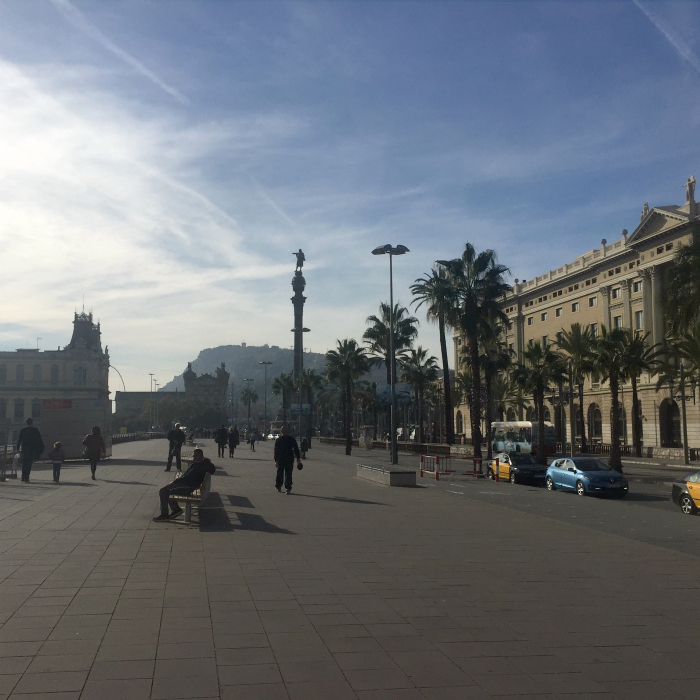 The museum also hosts a rooftop patio with great views of Barceloneta and the Mediterranean! Sunsets, seafood, and sipping on cocktails. 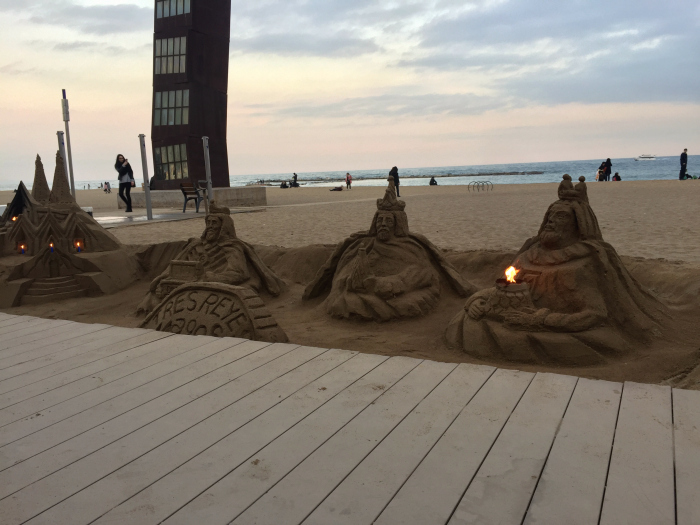 Meander your way among the streets of Barceloneta, and watch the sunset on the beach. When you’re done enjoying the sand and the waves, make your way to La Bona Sort in Borne for some traditional tapas for dinner. Ask to be seated in the garden (jardin) to feel like you’re sitting in your own secret garden. The grilled calamari and pulpo de Galicia are two of my favourite dishes! While you may be ready to head home after a long day of sightseeing, the city is just awakening. If you’re ready for a night fit for a heroine, head to Eldiset or Sub Rosa in Borne for some cocktails in an interesting atmosphere, or if you’re up for it, jump in a cab to Old Fashioned in trendy Gracia to be transported back to the 1920’s while sipping on one of their professionally made cocktails. 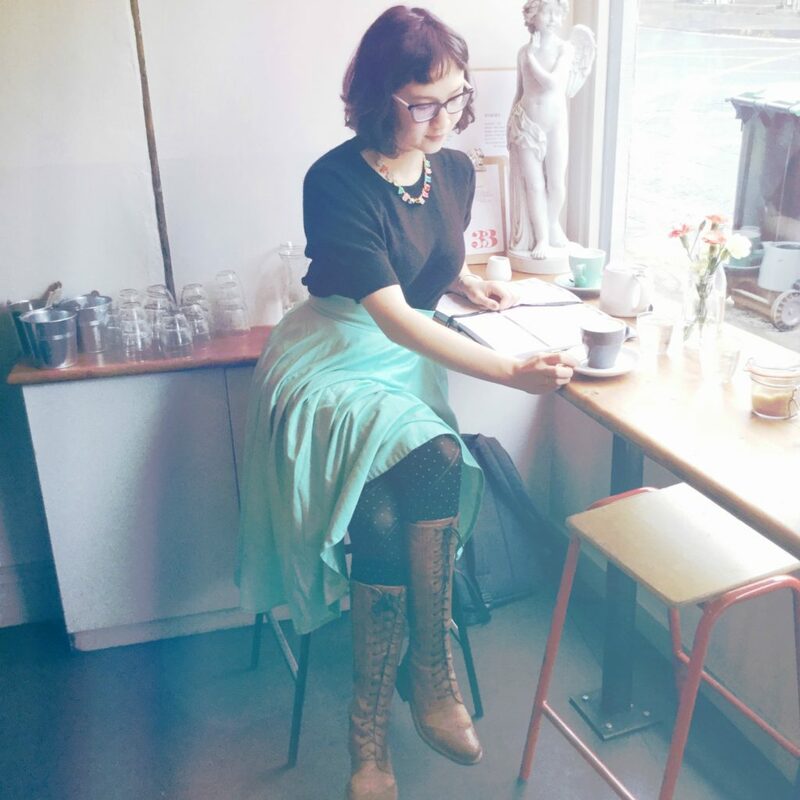 Kayla is a chronic traveler, writer, and flying (yoga) instructor for Lumos Your Life! 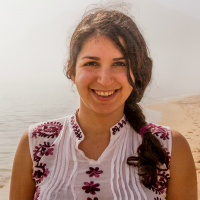 Currently bunkered up in Europe, but originally from Canada, she’s visited, lived, and worked in over 40 countries. Read more about her adventures working & traveling on her website, Twitter, and Instagram. Xandra Recommends > try adding Kayla’s 15-minute Yoga for Sleep routine to your evening ritual. Despite Kayla’s Gryffindor affiliations, this guide is filed under RAVENCLAW for including a pre-travel reading list. This time I didn’t mean to write Harry Potter lyrics. 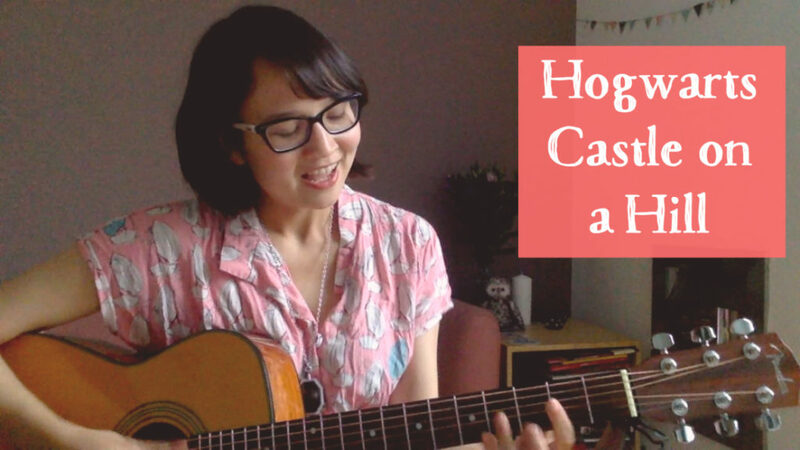 The plan was to personalise Ed Sheeran’s “Castle on the Hill” with nostalgic memories from my own childhood. Because most of these lyrics were Harry Potter-related anyway, I just went with it. Everything in the lyrics is true, except that I wasn’t 15. I wrote The Daily Prophet when I was 9, and attended my first book release at age 12, but 15 sounded better rhythmically. 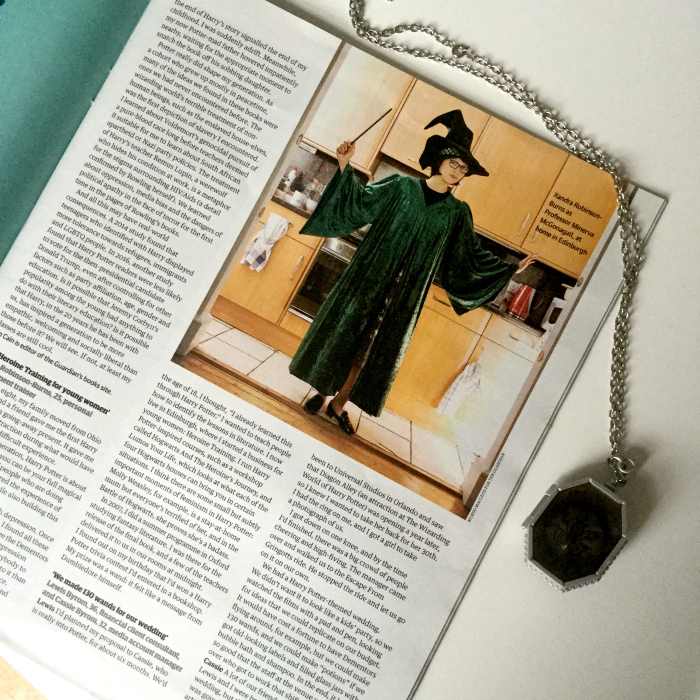 A little while after writing these lyrics, I saw in print in the Guardian magazine, an article about Harry Potter superfans, featuring…me! As the lyrics suggest, I did save magazine clippings, and wallpapered my closet with them. 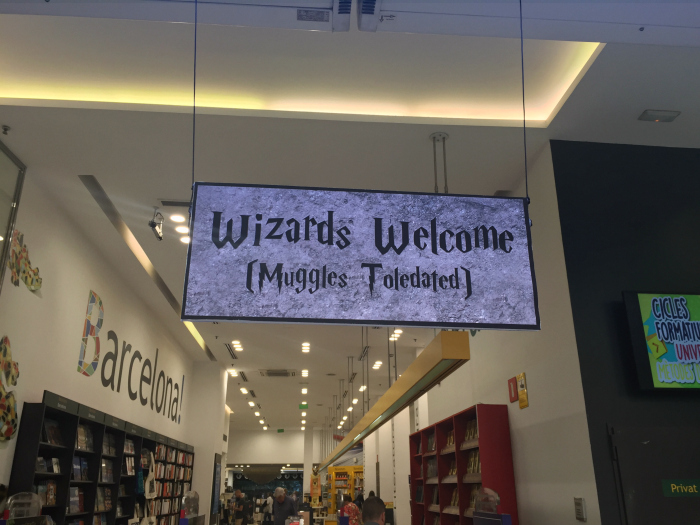 Not just of movie stills, but of literally anything Harry Potter related. It occurred to me that as a child I would have probably cut out the picture of me and put it on my wall. This song is filed under RAVENCLAW for wit, and for indulging in a project just for fun. 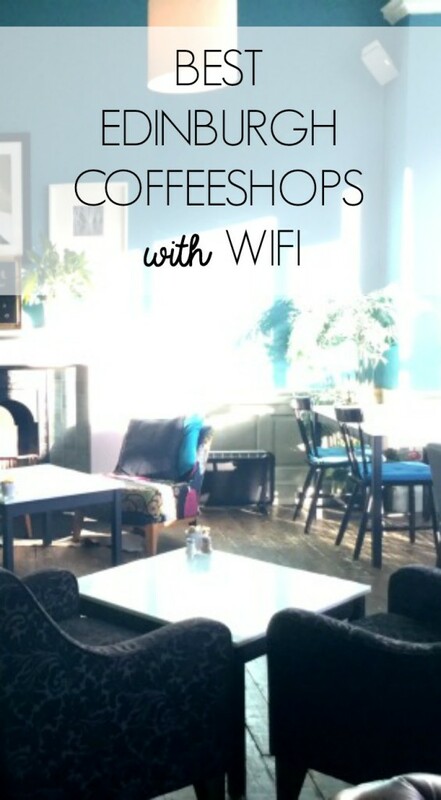 As a writer and website owner, I have the ultimate luxury of coffeeshop-hopping to various ‘offices’ around the city, enjoying inspiring spaces and preferably, their wifi. Because I couldn’t find a comprehensive list of Edinburgh wifi hotspots for nomadic writers, I decided to write my own! 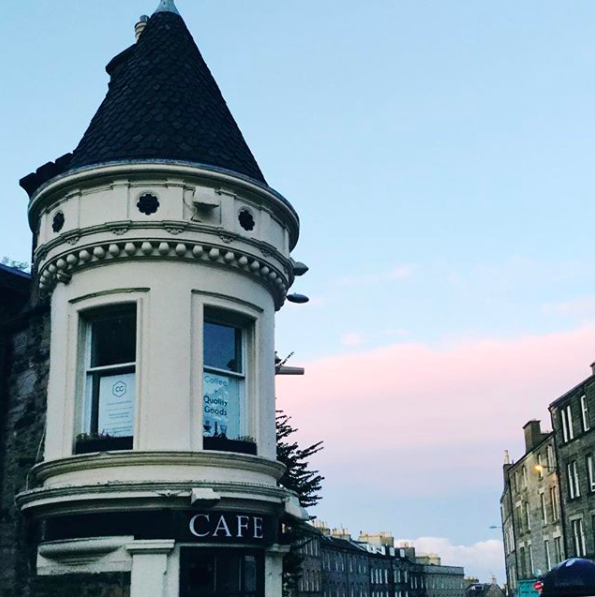 Here are your Wi-Fi guides to the neighbourhoods in Edinburgh. Enjoy! Dear dear Lovecrumbs, my personal obsession that has appeared on this website many a time already. It is a little piece of wonderland, featuring a wardrobe of fresh-baked cakes (with the strangest, most marvelous ingredients, such as courgette in cake and lavender icing), a piano in the back, and a pillow’ed windowseat ^. The only downside is its popularity – it’s one of those magic places where there is usually A space to squeeze in, but not always. Coffee connoisseurs flock here. 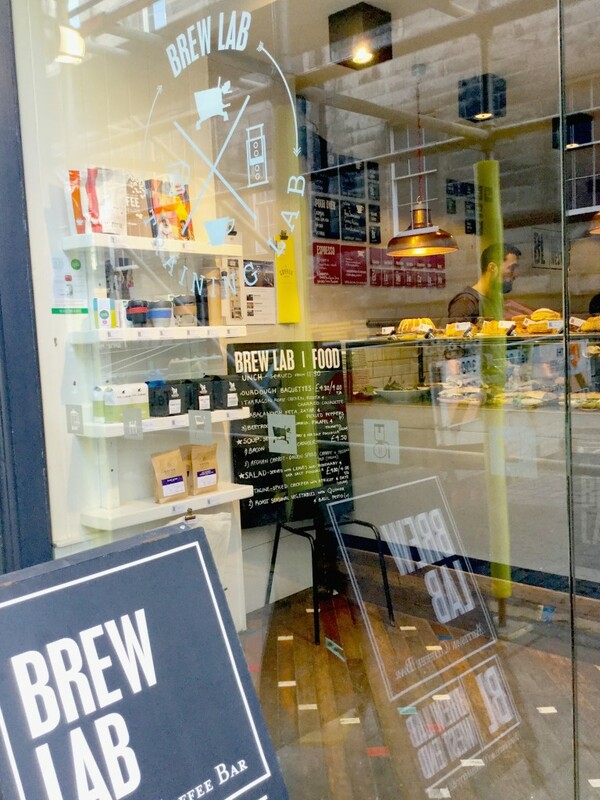 This is hipster central with artisan coffees and minimalist wooden tables. I have a favourite armchair for reading, and a favourite little nook for writing dates. It’s a great work environment, which means that it is often full to the brim with students sporting Ray Bans and laptops. Luckily, Spoon and Black Medicine are around the corner, so there are options. 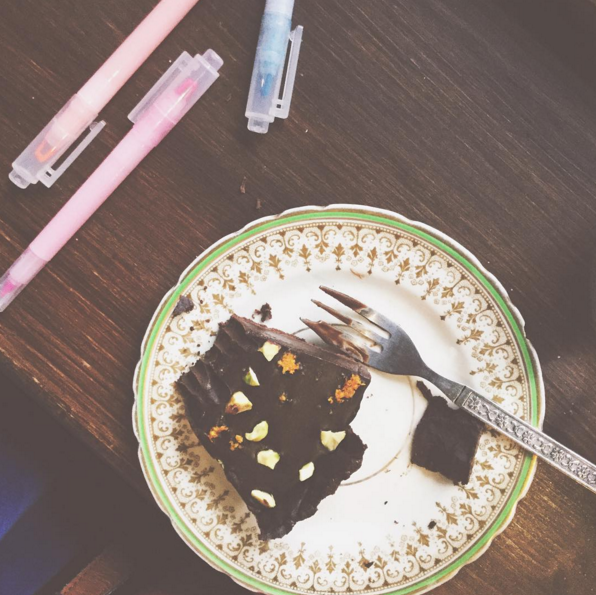 Coffee AND doughnuts made on the premises, tucked into the cosy Arches just around the corner from Waverly Station. Plus, the most fantastic views of Calton Hill! 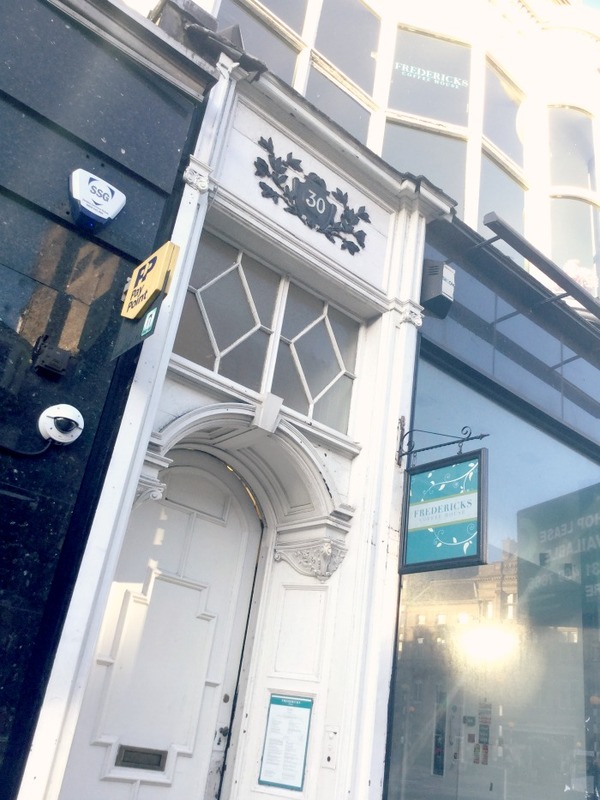 A hidden gem in the heart of New Town, styled in the kind of chic I’d like to emulate in my own home with comfy and stylish seats paired with vibrant blue walls. With a healthy variety of teas offered, it is often full on weekends, especially at mealtimes. However, because you have to hunt down the narrow stairwell leading to this beautiful nook, it remains unknown to many by being hidden in plain sight. Small and cosy with an excellent selection of magazines, feel like a local at Filament. I can trust the baristas here to really know their coffee, and they offer juice too! The Huxley calls itself “ a homely retreat from the bustle of our busy city”. I love it for its quality and design, which is the perfect blend of luxe and simplicity. Attached to the Rutland, a boutique hotel, it’s the kind of lovely place to pick up a croissant for a slow breakfast. Every detail, from the design to the menu seems carefully considered. The seating is laid out to accommodate diners as well as solo visitors, though not the type of place to sit for hours on a cup of coffee. This should not be a surprise, as I’ve hosted a couple events here in their turret tower! It’s quite a community feel here, with the very best coffee in town. We’ve passed the days of “paper or plastic”, where places like Scotland and California charge a bit extra for a carrier bag at the store. It’s always handy to have that extra bag on you, but what is it called? A “shopper”? A “portable shopping bag”? Well, Korea has a word for it: 망태 – mang tae. The organised among us carry extra bags, or reuse the plastic ones we’re given at the store, but the heroines treat such an object as mindfully as any other. Select your mang tae carefully so that you are happy to carry it with you, and even happier to take it out for use. 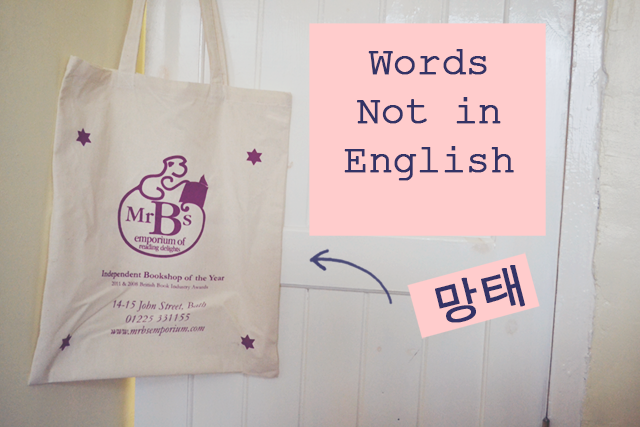 My mang tae include my Blogcademy tote, a Whole Foods bag commemorating my first food shopping trip in London, and, the newest in the collection, a Mr B’s tote to celebrate one of my favourite bookstores. Select your own mang tae with care. What makes it special to you? P.S. the cutest French word ever…. Some people call me the Don Quixote of the Latin Quarter because my mind is so far up in the clouds that I can imagine all of us are angels in paradise. And instead of being a bonafide bookseller, I am more like a frustrated novelist. In today’s world we tend to rush from one thing to another, to occupy ourselves, to scroll through our phones when we have a minute in which we’re asked to stand still. A mind in the clouds is not something people like very much these days – better to plant oneself on the ground firmly, where it’s safer. Better to be a “bonafide bookseller” than a “frustrated novelist”, and yet the latter describes the average individual more accurately. We are all trying to do something, and I take comfort in a place for misfit toys, a place where we can all try together, where we can all accept and share our creative struggles – celebrate them even. Paris’s Shakespeare & Company is a space for dreaming, exploring, and getting lost. Sure, it’s a tourist destination, but that is part of its community atmosphere – tourists are people who have felt the calling to travel, but might not know quite how to do it. Shakespeare & Company welcomes them inside its cosy chapter-book home, which is humble and inviting to all. It collects like-minded people, because if you don’t want to dream and read, why would you ever go inside? Its sporadic chairs are nearly always filled with readers, rather than the usual occupants of chairs in shops (think dads in shopping malls). Everyone is invested and involved. Upstairs hosts a writing corner with a typewriter, free for anyone to use in the company of the hundreds of poems and notes visitors have left all around. Shakespeare & Company reminds us that we are allowed to lose our minds in clouds and in books. I find that travelling is the best way to explore ourselves, and sometimes you don’t have to go anywhere but inside your head to do so.